Habitat: Chamomile is native to Europe. It grows best in clay, poor and mountain soils. 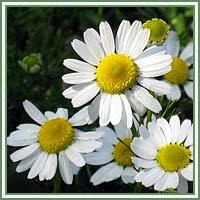 Description: Chamomile is a low-growing, annual plant. It has a smooth, erect and hairy stems which grow up to 60 cm. Leaves are long and narrow, bipinnate to tripinnate. Flowers appear solitary on long, erect stalks. They have white ray florets and hollow, conical center, yellow in color. Chamomile flowers from July to September. The fruit is small and dry. Useful components: Coumarin, cyanogenic glycosides, flavonoids, sailcylates, tannins, volatile oil, valerianic acid. Medicinal use: Chamomile has been used for centuries for a variety of ailments. It has a strong, aromatic scent. Chamomile is considered to have analgesic, anti-inflammatory, antispasmodic, anodyne, carminative, diaphoretic, laxative, stomachic, sedative and tonic properties. It has calming and soothing properties. It is used for nervousness, headaches, anxiety, and hysteria. Chamomile also soothes and calms stomach and is often recommended for various digestive problems: it helps relieve abdominal pain and is commonly used in treatment of indigestion, gastritis, excessive gas, abdominal bloating, colic, hernia, peptic ulcer. Chamomile tea is also useful in easing menstrual pain, treating hay fever and asthma. Used externally, it soothes the skin, helps in cases of various allergies, sore skin and eczema. 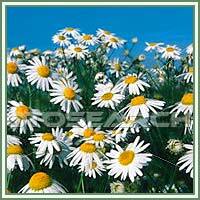 Safety: In rare cases Chamomile could provoke allergic reactions. Some herbs could react with certain medication. Therefore, it is advisable to consult your doctor/herbalist before consumption of any herb.